Air France-KLM have announced that it will be exploring the potential benefits that blockchain technology can bring to its business model. The air travel giant will be working with Winding Tree to bring increased efficiency and savings to both customers and businesses alike. Can Blockchain Bring Savings to Airline Users? According to a press release from Winding Tree, the startup, which founded in 2017, will be working with Air France-KLM to bring the blockchain technology to the travel industry giant’s business practices. The French airline will be using the firm’s business-to-business platform. It is believed that the increased efficiency and transparency afforded by blockchain technology will translate into savings for both users and the companies the carrier works with. The partnership, announced today, further highlights the French airline’s commitment to exploring innovative technologies. Along with the blockchain, the firm is developing improvements using machine learning and artificial intelligence. These include chatbots and baggage tracking services. Pedro Anderson, the founder of Winding Tree, also commented on the partnership. He outlined his company’s commitment to improving the traveler’s experience by using blockchain technology, and expressed excitement to be working with one of the industry’s biggest names. Winding Tree describes itself as a “blockchain-based, decentralised, open-source travel distribution platform.” Its goal is to create savings for both the users of established travel services and the companies providing them. Those behind the company also believe that the technology can allow smaller firms to compete with industry giants. This leveling of the playing field should promote greater competition and result in increased benefits for both users and companies. Air France-KLM is not the first airline carrier to look into the benefits of blockchain technology to increase efficiency. In July 2017, Russia’s S7 introduced a blockchain ticketing system making it easier for the firm to allocate tickets through various agents. Fellow Russian airline, Aeroflot, also made several proposals for blockchain systems in their own business model last summer. It is unclear how these have developed since their time of announcement, however. 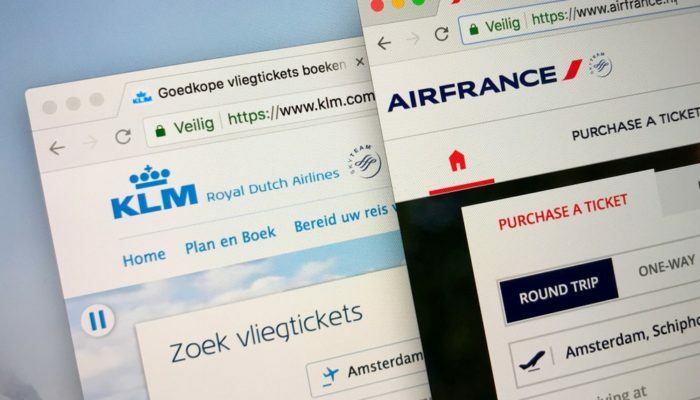 Air France-KLM Partners with Winding Tree to Bring Blockchain Benefits to Travelers was last modified: October 4th, 2018 by Rick D.